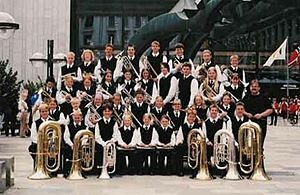 A concert band, also called wind ensemble, symphonic band, wind symphony, wind orchestra, wind band, symphonic winds, symphony band, or symphonic wind ensemble, is a performing ensemble consisting of members of the woodwind, brass, and percussion families of instruments, along with the double bass. A concert band’s repertoire includes original wind compositions, transcriptions/arrangements of orchestral compositions, light music, and popular tunes. Though the instrumentation is similar, a concert band is distinguished from the marching band in that its primary function is as a concert ensemble. The standard repertoire for the concert band does, however, contain concert marches. In the 18th century, military ensembles were doing double duty as entertainment at the royal courts, either alone or combined with orchestral strings. Composers such as Mozart were writing chamber music for these groups, called Harmonie bands, which evolved to a standard instrumentation of two oboes, two clarinets, two horns, and two bassoons. In addition to original compositions, these groups also played transcriptions of opera music. Contact with the music of the Turkish Janissaries contributed to the expansion of the Western European wind band. The splendor and dramatic effect of their percussion prompted the adoption of bass drum, cymbals, and triangle, as well as piccolo to balance the increased weight of the percussion section; see Turkish music (style). More clarinets were gradually added and brass instruments were further developed. The wind band eventually reached its current size, though the instrumentation differed in various countries. During the 19th century large ensembles of wind and percussion instruments in the English and American traditions existed mainly in the form of the military band for ceremonial and festive occasions, and the works performed consisted mostly of marches. The only time wind bands were used in a concert setting comparable to that of a symphony orchestra was when transcriptions of orchestral or operatic pieces were arranged and performed, as there were comparatively few original concert works for a large wind ensemble. One notable and influential original symphonic work for band was Gustav Holst’s First Suite in E-Flat, written in 1909, considered to this day the classic work of symphonic band. Following Holst, a variety of British, American, Canadian and Australian composers wrote for the medium, including Percy Grainger, James Swearingen and Ralph Vaughan Williams. This led to the formation of the University and College Band Conductors Conference in 1941—renamed the College Band Directors’ National Association in 1947—and spawned the commissioning of works from a wide variety of composers. The modern wind ensemble was established by Frederick Fennell at Eastman School of Music as the Eastman Wind Ensemble in 1952 after the model of the orchestra: a pool of players from which a composer can select in order to create different sonorities. The wind ensemble could be said to be modeled on the wind section of a “Wagner” orchestra, an important difference being the addition of saxophones and baritone/euphonium. (The American Wind Symphony Orchestra, which uses neither of these, adheres more strictly to the “expanded orchestral wind section” model.) While many people consider the wind ensemble to be one player on a part, this is only practical in true chamber music. Full band pieces usually require doubling or tripling of the clarinet parts, and six trumpeters is typical in a wind ensemble. According to Fennell, the wind ensemble was not revolutionary, but developed naturally out of the music that led him to the concept. However, the concept was in stark contrast to the large collegiate symphony bands of the time, particularly the 100-member band of the University of Michigan, conducted by William D. Revelli and even larger University of Illinois Concert Band as configured by A. Austin Harding and Mark Hindsley. H. Robert Reynolds and others of his school of thought extended the Eastman model for wind ensembles, declaring that the wind ensemble should play only original wind ensemble works — no transcriptions, and no band pieces such as the Sousa marches or concert music intended for larger symphonic winds. This music should be of a serious and worthwhile nature, or the highest quality. Time and practicality have moderated this position, and today even Reynolds has produced quality arrangements for the modern wind band. Contemporary composers found that wind bands offered a welcome opportunity to perform new music, in contrast to the conservative stance maintained by many symphony orchestras. 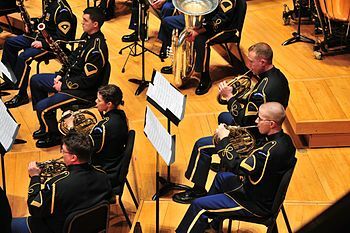 The majority of full-time professional ensembles are military bands and, outside the United States, also police bands. One example is the Air Force Academy Band (inception in 1942 as the “Flying Yanks”, reactivated for the United States Air Force Academy in 1955, Colorado Springs, CO). This band has often been cited as, “The Thunderbirds of the Air Force Band Program”. Lesbian & Gay Big Apple Corps, New York, NY, conducted by Kelly Watkins. School bands vary in size and instrumentation, depending on the number of students that are in the band, and the versatility and virtuosity of the players. Some school bands follow a set educational program which dictates particular styles of pieces that are standard to the music curriculum. Such curricula usually include a concert overture, a march, and a miscellaneous band piece, often one in the pop music genre. The director may also slightly bypass the curriculum, choosing music of whatever style he or she pleases, especially if the band is small. In the U.S., some schools have a school orchestra and choir as well. Some private and public schools have bands, orchestras, and choirs, especially if the district is very large. Throughout much of their history, wind bands have been promoted through regional and national music competitions and festivals. Currently, the largest among these is the annual All-Japan Band Association national contest, which in recent years has included around 14,000 bands. Other large competitions include the World Music Competition, held in the Netherlands; and the Southeast Asia Concert Band Festival, held in Hong Kong. Instrumentation for the wind band is not standardized; composers will frequently add or omit parts. 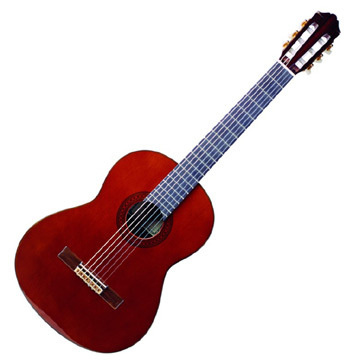 Instruments and parts in parentheses are less common but still often used; due to the fact that some bands are missing these instruments, important lines for these instruments are often cued into other parts.